A ski resort in the heart of a vast natural space. Valmorel is resolutely authentic and can be proud of its respect for the environment; no big apartment blocks to spoil the landscape. As for the lifts, they are carefully situated and are of such sizes that they blend better into the resort’s wild and untouched setting. For all that, Valmorel remains a modern and well equipped resort. Its 150 km of pistes invite skiers, both beginners and experienced, to enjoy the pleasures of snow riding sports; vertiginous slopes, wide open spaces as well as forests and gentle mountains a palette of backdrops to meet all tastes. 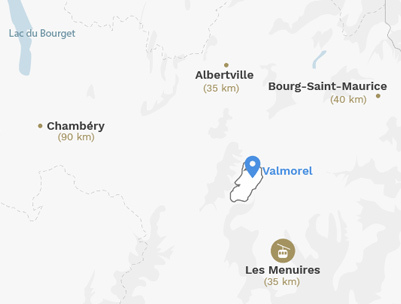 Valmorel is ideal for lovers of the mountains and natural unspoilt surroundings as well as all the activities that this environment has to offer. In Champagny-en-Vanoise, summer and winter alike it is vibrant with all its attractions.